President Ilham Aliyev ordered the case to be dropped after an international and domestic outpouring of support for the young imprisoned blogger. Activists cheered the concession as a victory of people power. Prosecutors have decided to drop criminal charges against an imprisoned blogger and activist, Mehman Huseynov, after President Ilham Aliyev ordered the blogger’s case to be reconsidered. The surprise termination of the new criminal case was announced on January 22 by the Azerbaijani General Prosecutor's Office. Mehman Huseynov, 26, is Azerbaijan’s best-known political blogger and is serving a two-year prison sentence on charges that he defamed police officers. He had been set to be released in March, but in late December the Azerbaijani authorities brought new charges against him, claiming that Huseynov had attacked a prison guard. Huseynov denied the new charges, which could have added several more years to his term, and started a hunger strike to call attention to his plight. “The criminal case against Huseynov was terminated due to the fact that he is young, has not been subjected to disciplinary liability during his term of punishment, took the path of reform, and he has an elderly father who needs care,” the press service of the General Prosecutor's Office said in its announcement. The news came two days after the government announced that Huseynov had personally appealed to Aliyev, asking him to “order the correct investigation of my case.” He denied that he attacked a guard and said that “If I get a new term, it will be a big blow to my 70-year-old father.” It could not be independently determined whether or not Huseynov wrote the letter. One of Huseynov’s lawyers, Fuad Agayev, told Meydan TV he was unaware of the appeal. 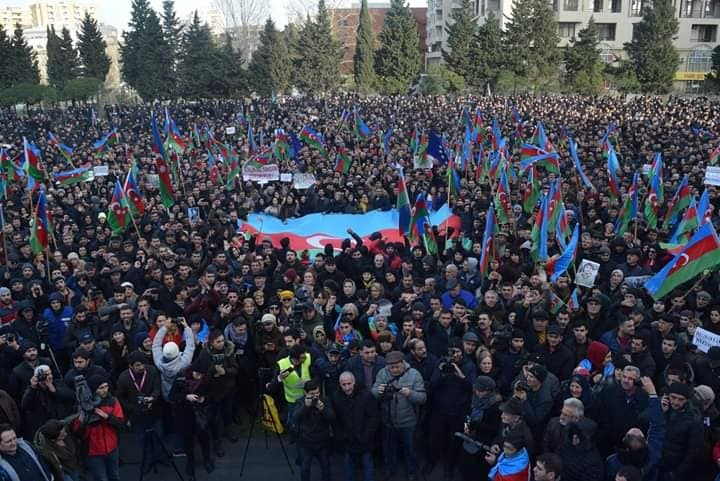 It also followed a large rally in Baku in support of Huseynov on January 19. Organizers said 25,000 people attended, while police put the number at 2,800. In any case, the rally was larger than many expected and appeared to be the largest opposition rally in the country in at least five years. Prominent investigative journalist Khadija Ismayilova, one of many activists who undertook hunger strikes in solidarity with Huseynov, subsequently announced that she was halting her strike, connecting it with the large turnout. “Today’s rally show[ed] that the society is awake and their voice is louder than our hunger’s,” she wrote on Facebook. Fuad Alasgarov, a senior adviser to Aliyev, said that the president was moved to act following Huseynov’s appeal. “Aliyev has always been sensitive to such kind of requests, followed the principles of justice and humanity, and required the same approach from all state officials,” Alasgarov said. According to Human Rights Watch’s 2018 report, “At least 43 human rights defenders, journalists, political and religious activists remained wrongfully imprisoned, while dozens more were detained or under criminal investigation, faced harassment and travel bans, or fled Azerbaijan." Lamiya Adilgizi is a freelance Azerbaijani journalist. Sign up for Eurasianet's free weekly newsletter.